Yesterday I made my trek to The Fish Market on the pier to get my wild caught fresh Salmon. I was so sad when I got there because the only Salmon they had behind the counter was farmed. Sigh. 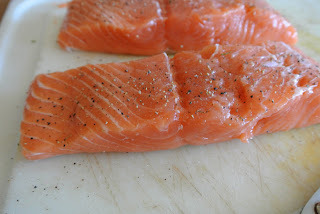 I started looking through all the other beautiful wild fish, trying to re-think what I would be making for dinner. Then I just thought: "This is not right! They always have wild caught!" So when the butcher came to ask me if he could help, I asked him if he had any wild Salmon in back. He joyfully told me some had just been caught but it had not been cut in to filet's yet. So I gave him a nice smile and asked if he would be willing to cut it for me. He was so nice and did it for me! So my dinner plans were back on track. I am not supposed to eat farmed Salmon. I am not going to get in a big debate on here about it. I don't judge and if you are fine with farmed, then that is fine with me. It just happens to be on the list of top 10 most cancer causing foods, according to Underground Health. Since I am fighting Cancer right now, don't think I will be risking it. "Farmed salmon is another high-risk cancer food", according to Dr. David Carpenter, Director of the Institute for Health and the Environment at the University of Albany. According to his assessment, farmed salmon not only lacks vitamin D, but it is often contaminated with carcinogenic chemicals, PCBs (polychlorinated biphenyls), flame retardants, pesticides, and antibiotics. So no farmed for me thanks. I also don't ever get fish from the markets when it says "color added". Hello... that is a chemical! Just give me good old fish! 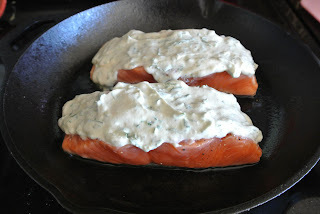 I love preparing a fresh wild caught Salmon. The fish is so tender and juicy. It is so easy and fast to make too. This is one of my favorite ways to make it. Healthy and delicious! Combine yogurt, mustard, dill, and parsley; season with salt and pepper. Place salmon, skin side down, on a rimmed baking sheet, or oven safe pan. 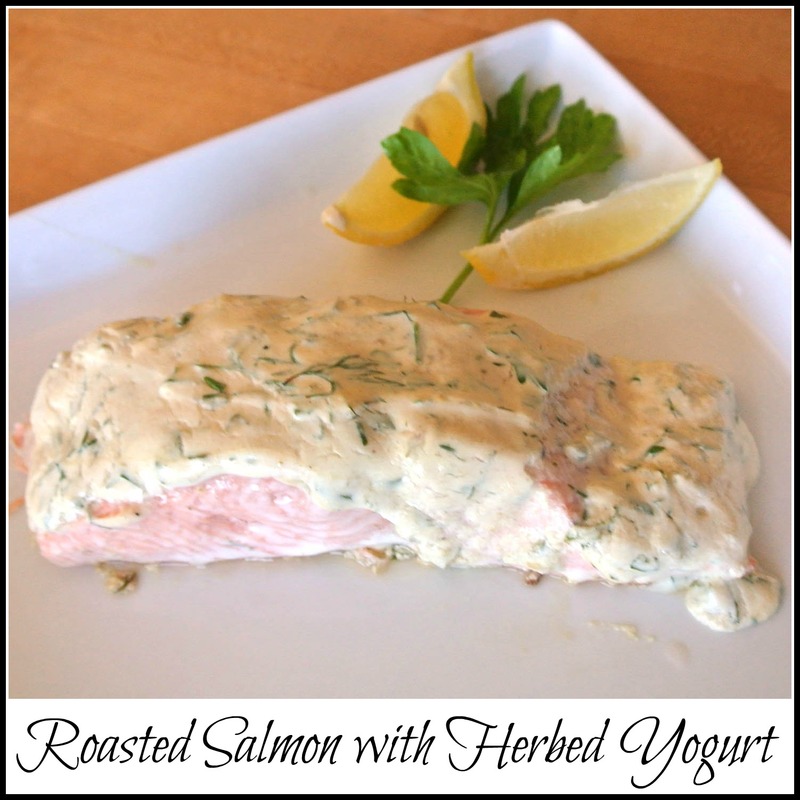 Spread yogurt mixture on salmon. Roast until opaque throughout... 10 minutes. 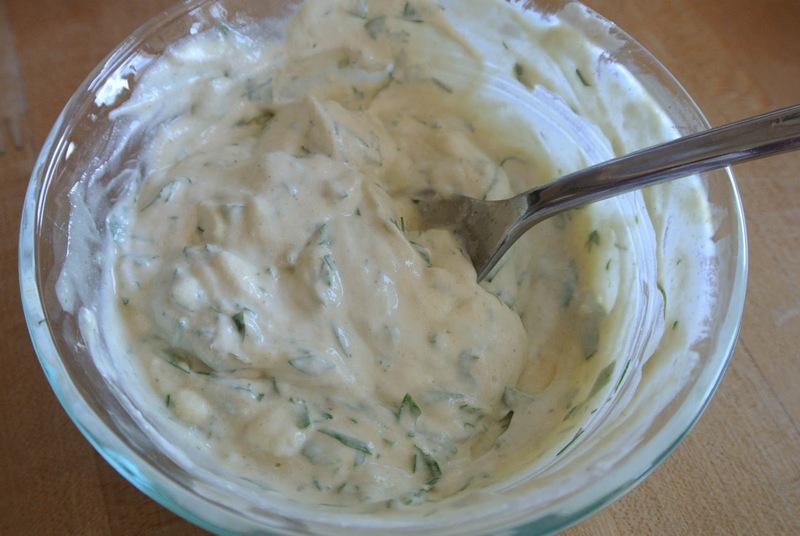 Sprinkle with dill sprigs and serve warm or at room temperature with lemon wedges.